By now, stitching together photographs to create a panorama or 3D image bubble is old hat. But the new Photosynth formats that Microsoft has developed and published fuse information and art—so much so that serious photobugs should check them out. Historically, Microsoft’s Photosynths were based on photos stitched together to form an image. With the new version of Photosynth Microsoft is rolling out, the company has expanded the types of formats: the traditional panorama, a “spin” around a fixed object or point, a “walk,” and a “wall.” It’s the latter two that offer the most artistic possibilities, and a complement to the 3D-enabled Bing Maps Preview that Microsoft recently rolled out. 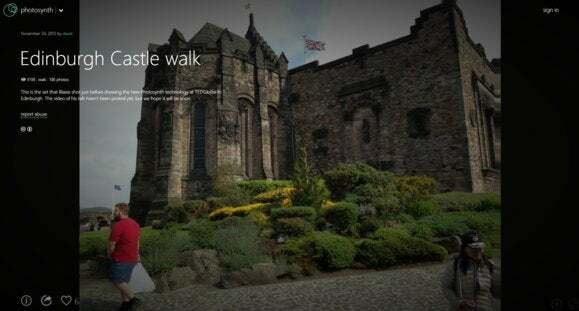 As you can see, the “walk” is simply a guided tour of the castle entrance. Unlike a traditional Photosynth, there’s no opportunity for spinning around and “exploring” the area—this isn’t a way to create your own “street view” tour in Google Maps or Bing. But, even with the limitations of the Photosynth framework, this nevertheless looks like a marvelous opportunity to merge art and information. Yes, an app like Vine is infinitely simpler, and there’s no indication that users will be able to stitch together their synths without sitting down at a Windows PC. But if you can walk it, you can synth it: strolling down the aisle to show off a wedding venue, for example, or emerging from the tunnel at the Coliseum. And note the “ghosting” effect as people enter and fade from the scene. As with Microsoft’s earlier photosynths, the PhotoSynth tools looks for points of commonality among a series of photographs that a user uploads, and then uses those points to “fuse” the photos together. The more photos a user uploads, the more detailed a scene will be. How do you start using the new formats? Users who sign up for an account on the Photosynth.net (or who already have an account) site can ask for an upgrade to the new formats. Numerous apps, whether they be native to platforms like Android or iOS or created by third-party developers, already offer an array of photo-enhancement tools from grids to filters to panoramas. But Microsoft’s new Photosynth tool won’t easily be duplicated by an app like Instagram. Microsoft may be following in the footsteps of Google with its newfound focus on 3D imagery, but artistically it’s branching out in new directions, too.